Emily's Recipes and Reviews | UK Food Blog | Leicestershire : #trymymenu: a taste of italy. 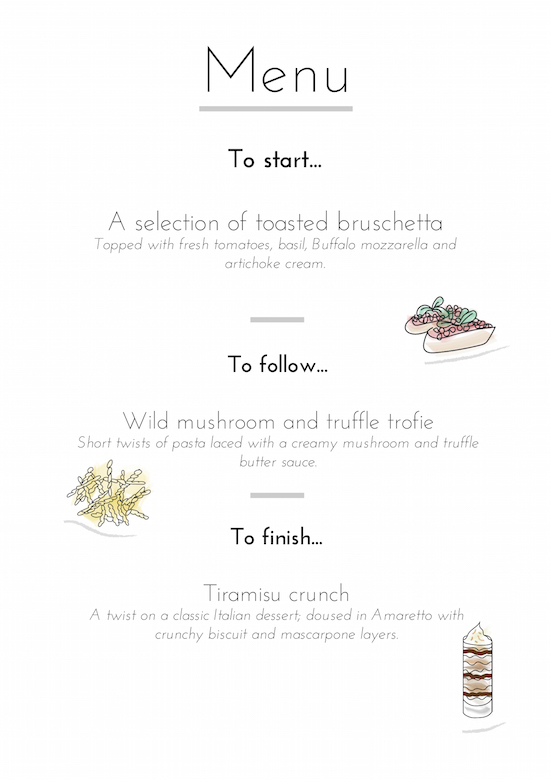 Inspired by my recent trip to Rome, I recreated my favourite flavours in the form of a three course Italian menu. With StressFreePrint on hand to print out my very own illustrated menu designs, I opted for Italian simplicity for a stress free dinner party. With classic (and super simple) bruschetta to start, I went on to serve my Rome bought trofie pasta along with truffle butter from Ad Hoc. To finish, I tried my hand at making timeless tiramisu, which is perfect to prepare ahead for dinner party desserts! As I mentioned, I wanted to add a taste of traditional Italy to my party to make it as authentic as possible. As I wanted a stress free night, there was no room for homemade pasta here. Instead it was the perfect opportunity to use my trofie shape pasta I bought on holiday. The small twists were perfect for lapping up my creamy truffle butter sauce. As for fresh ingredients, I went for the best I could find and afford. I'd sampled some delicious creamed artichoke bruschetta on my holiday so headed straight to my deli counter and picked up some roasted artichoke. All I had to do here was whizz it up and spread on my toasted baguette slices. Honestly - you need to try it! We were spoilt for choice with caprese salads too. I was keen to buy official D.O.P. mozzarella which is best served cold with its gorgeous fresh and creamy flavour. Again fresh basil was a must - a super cheap herb but so fragrant and delicious. I've used these wild mushrooms in lots of recipes before. They're so pretty and add a bit of finesse to a mushroom dish. Sorry portobello, you're so last season. With everything it was all about prepping ahead. I made and layered up my tiramisu crunch earlier in the day, then simply popped in the fridge. With my bruschetta, I didn't want the bread to go soggy with the topping so just did as much as possible in advance. This involved toasted the sliced bread in the oven and whizzing up the toppings in a food processor. On the drinks front - it had to be Prosecco. Like Champagne, it is only official Prosecco if from the Italian region of the same name. It was an excuse to get the fizz on ice and bring out the posh glasses! Ta da! Just minutes later and the simple starters were on the table. I have lots of slates, platters and wooden board which are great for special dinners. On a related note, the customers services team were actually super helpful with my menu printing order - suggesting silk art paper (semi-gloss), colour front and back and matt finish to both sides. For design geeks like me, you would have loved the paper and print quality! For main, it was time for pasta! I made this simple creamy sauce with 100ml double cream, a tsp of truffle butter and salt and pepper to season. The mushrooms are cooked in the sauce whilst the pasta boils. I used a little pasta water in the sauce too as I find it gives a glossy sheen and extra starch for the pasta. Top with parmesan and black pepper to serve! To finish, out came the pre prepared tiramisu to save the day! Anything like an Eton mess, lemon posset or chocolate mousse pot is perfect for time saving puds. I added some extra amaretto biscuits to the top to add extra crunch - plus I love anything with an almond flavour. What are your favourite Italian dishes? Have you ever hosted a dinner party or planned a three course menu? I'd love to hear your thoughts. If you make any of my recipe make sure you tweet me @emily_etc with the hashtag #TryMyMenu! Oh wow Emily! What a delicious looking dinner :) I've only ever managed 2 courses, I should probably try my hand at 3 soon. I love Italian and the menu you've put together is great! Emily you absolute rogue this all looks amazing!! Very jealous of the pasta you brought all the way home from Rome..
And where was my invite Mrs! Looks great and the menus are lovely!